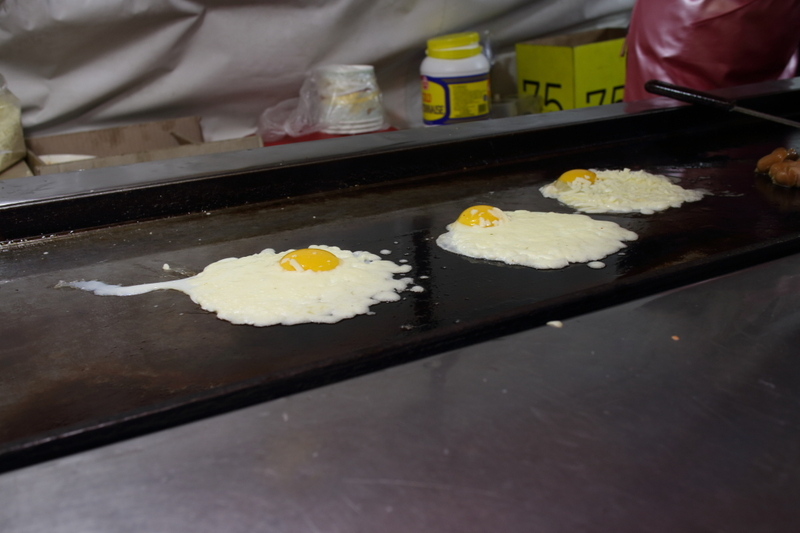 If you’re ever in the mood to try unique street food, try the Noryangjin Station (노량진역) area. 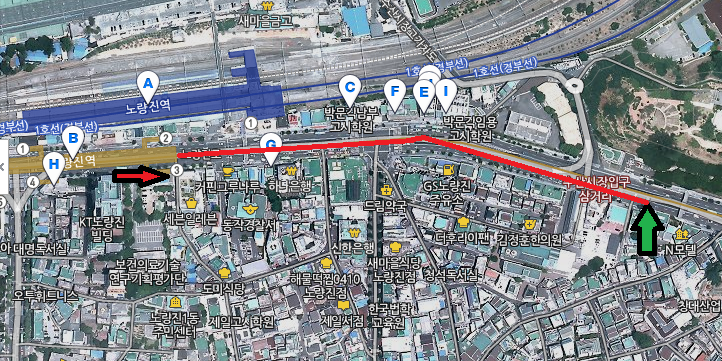 There’s a lot of diversity between food stalls which is actually pretty rare in most areas of Seoul. It’s actually a challenge to find the typical tteokbokki stand here, but that’s a good thing as there are plenty of other foods to entice you. I went to one of the stands that was quite a bit off of the beaten path called “real kimchi stirfry over rice” or “레알김치볶음덥밥”. You can get to it by heading out of exit 3 and continuing east on the same road. This cram school is pretty much parallel to the street stall. Pretty unpretentious. As you can see the whole tent is covered to keep the environment as clean as possible. 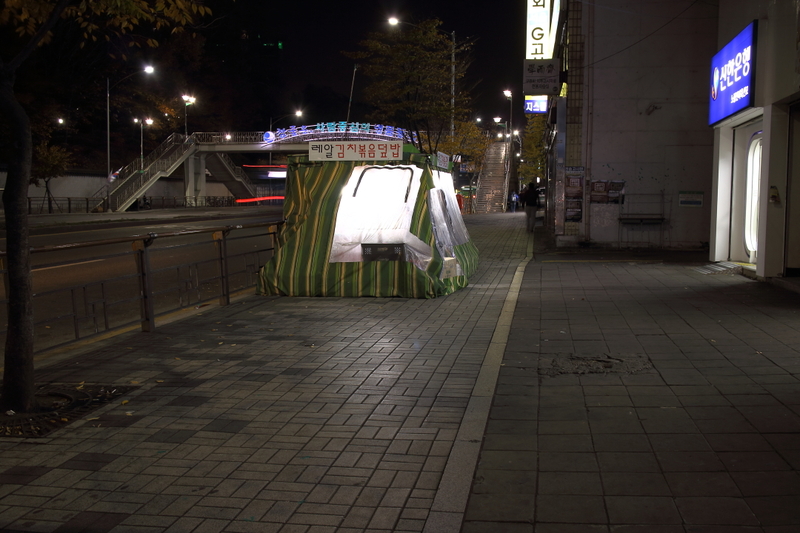 It’s a food stall that’s been here for quite some time with a max seating of around 8 at most. You can often find it busy with cram school students and the place is quite clean and tidy. The place is only open during late day/night because of this. The owner specifically covered the whole tent to make the environment feel completely indoors. 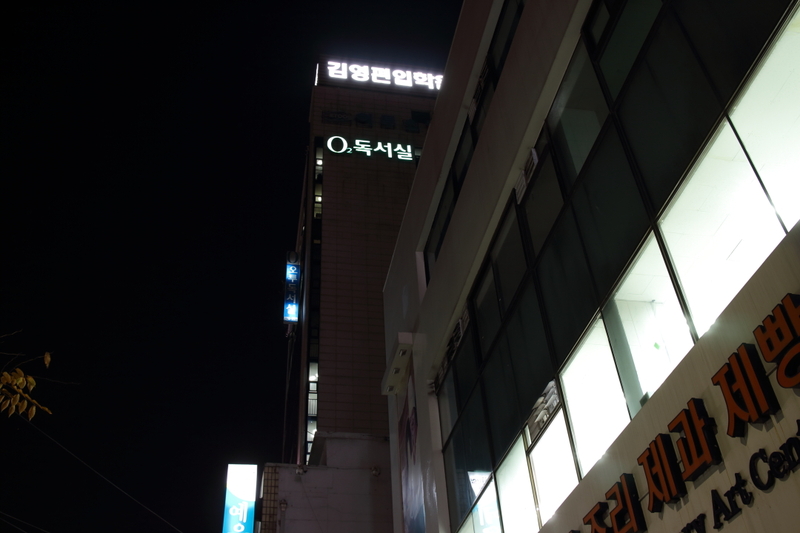 You will need to know Korean, or have a Korean friend to help you as the place is not terribly English friendly. 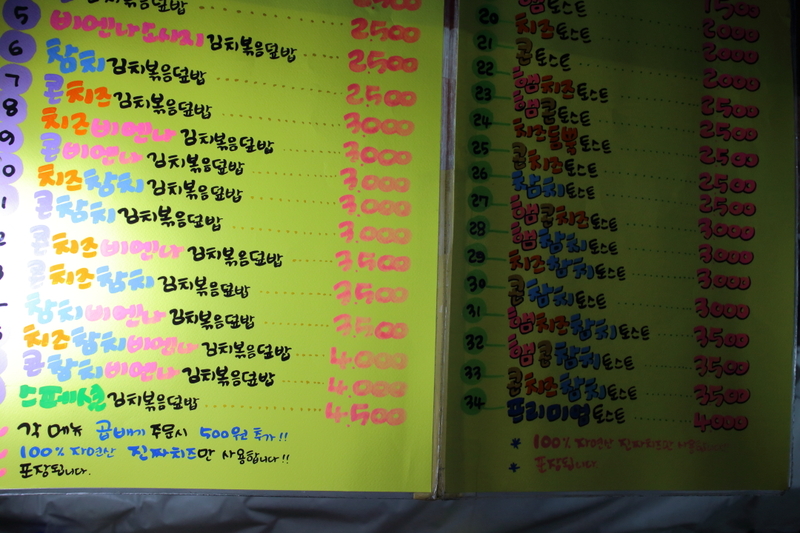 The menu doesn’t have anything over 5000 won with most items ranging between 3000 to 4000 won. The specialty here is the kimchi stirfry rice, with a choice of vienna sausages, corn, tuna, and cheese. You can order a large size known as a “곱배기” for an extra 500 won! 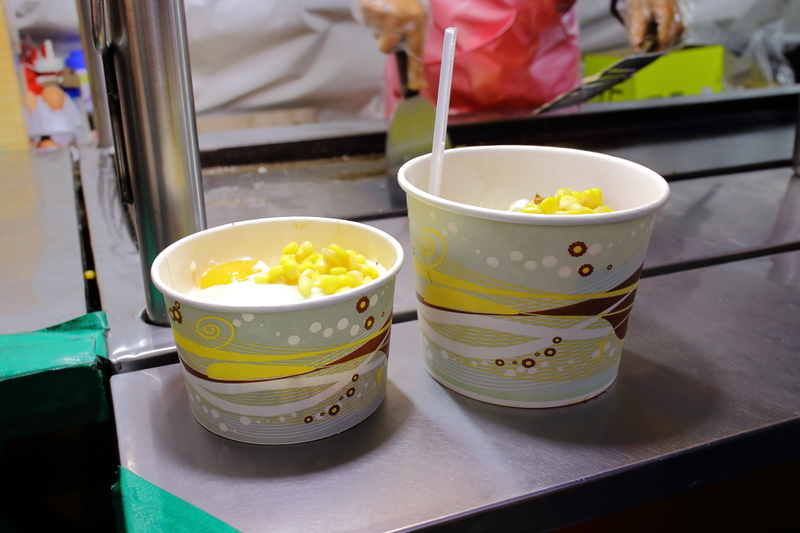 The owner prides her food as 100% natural with real cheese, which is always a plus in Korea. Every rice dish comes with an egg. If you order it with cheese, you’ll see the owner go into the bag of cheese and place it ever so delicately on the egg while it cooks. The owner changes gloves whenever handling money, so germaphobes don’t worry! If you order vienna sausage, she’ll grill that too, but tuna and corn don’t get the same treatment. All the ingredients warm up once you mix the dish though. Every rice dish comes with an egg. Cheese is up to you, but it’s a necessity for me. 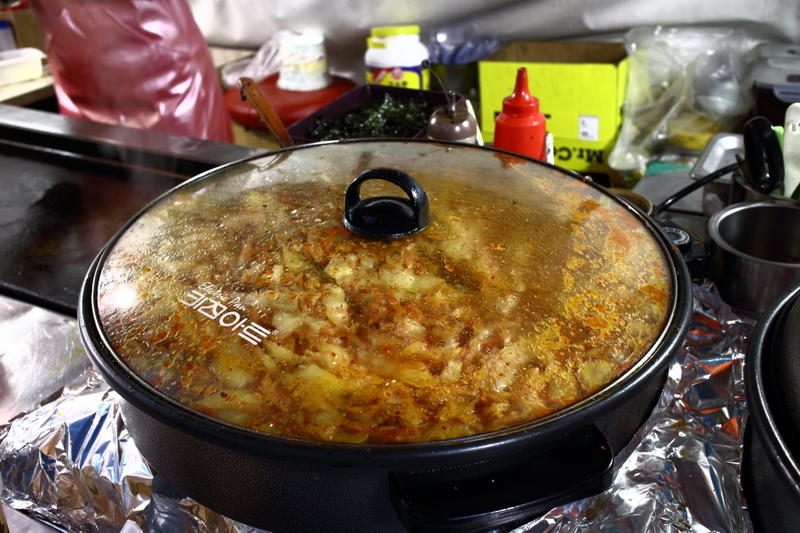 Kimchi being cooked down to perfection. The rice dish comes with the toppings on the top. You’re supposed to mix it and that’s when the beautiful harmony of all the toppings fuse perfectly. 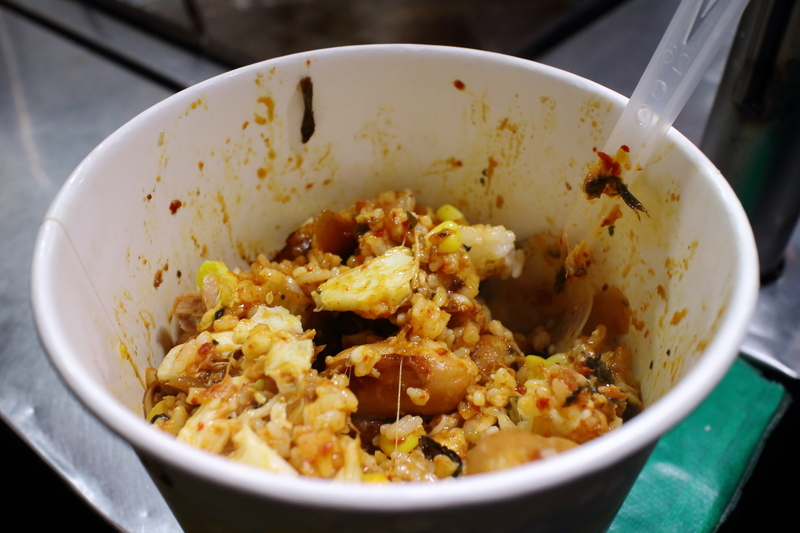 It has a very nice set of textures and chewiness, with a wonderful ratio of toppings to rice. It’s not salty at all, like some kimchi dishes. 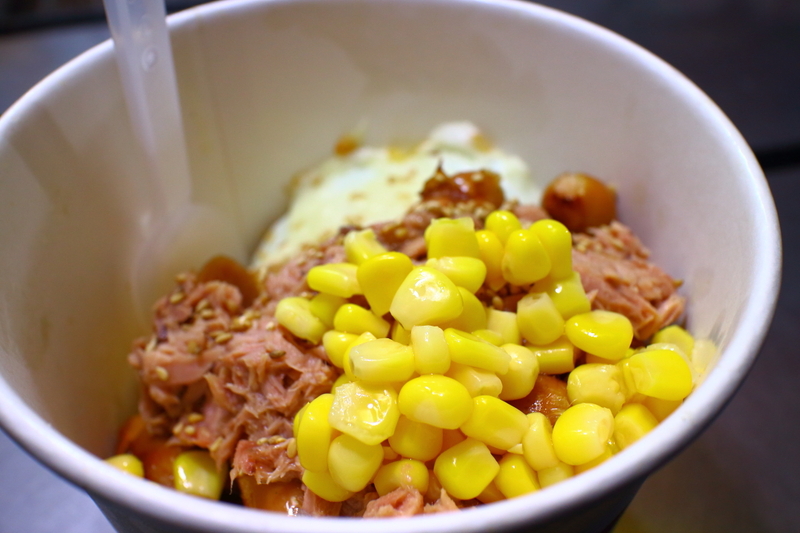 Cheese, tuna, vienna sausage, corn, kimchi, and egg, over rice. After giving it a good mix. Size difference between regular and large. This place will definitely satisfy those looking for a more authentic experience to Korean street food. If you ever visit the Noryangjin fish market or arcades, be sure to give this little gem a visit!